Hidden World is the name of the 3rd sequel of the saga How to Train Your Dragon. Released on February 22nd, the Dreamwork’s film is already a huge success and has raised more than 500 million dollars worldwide over 4,286 theatres. With the mission of rescuing all the caged dragons, Hiccup, the chief of the Berkians, gathers an immensity of these fantastic creatures in the Viking village, with the aim to protect them from the violent humans. The peaceful life between humans and dragons is only possible in the village Berk, due to the love and affection that citizens and animals had for each other. But during the trilogy, the more dragons Hiccup rescues, the faster his name expands among criminals who want to see the mythical species extinct and the greater is the risk of the village to suffer an attack. And it’s when the fame of Hiccup, voice character given by Jay Baruchel, reaches the ears of Grimmel, the Grisly, that the real danger appears with the aim of stealing the legendary dragon Night Fury. The only living specimen, since the others had already been killed by the crooked, but clever, dragonslayer who aims to conquer the world. Thus, aware of the danger he was facing, the young boss assumes a plan to save everyone’s life. Remembering his father and former leader of the Viking tribe had spoken to him about the resplendent hidden world and how it was from there that all the dragons were born, it occurs to him the idea of moving the village to the sacred place, where they could enjoy a peaceful future. 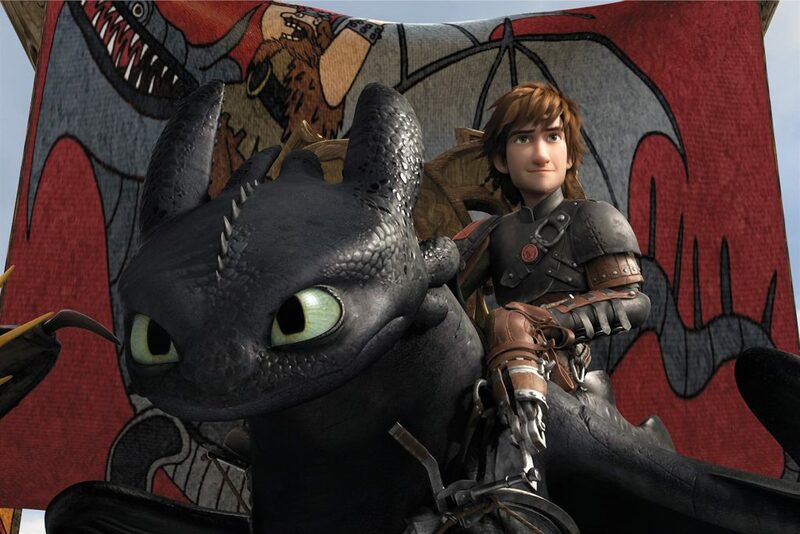 Contrary to the previous sequences of this adventure animation we have the action divided not only by the human perspective, but also showing Toothless, the iconic friend of Hiccup. In the development of history, Toothless falls in love with a graceful dragon female, also rare, which Astrid gives the name of Light Fury. Meanwhile the scenes of the little dragon trying to woo his beloved, make us delighted in laughs by his foolishness. In the other hand we see the affecting bitterness that Hiccup feels for knowing that at some point will have to let his friend go and he will be lonely. However, his girlfriend Astrid, voiced by America Ferrera, advise him several times and encourages his fighting spirit that he had latent. Both decide to leave in order to rescue one of their friends, imprisoned by Grimmel. At some point by a lucky mistake, they end up finding the undercover entrance to the cave of the shining world of dragons under a waterfall. Then it was possible to see, the alpha of kings, Toothless, leading a multitude of dragons along with his queen… It was the end of a thrilling race for a new home by Berk’s population. Back to the village, they are followed by the villain who threatens to kill Light Fury, kidnap all the dragons and disappear in the ocean. After that, even though he was empty of meaning, Hiccup needs to fill himself and the others with courage to save his friend and the other dragons. In an epic battle aboard a ship, happens the culmination of a whole philosophy of actions that discusses the peaceful coexistence between animals and humans in the world and the friendship between them. Then, we have the conclusion in the Hiccup’s memory, about his father fading in slowly: “there is nothing greater than love although it hurts sometimes, it’s part of life and is worth it”. The advice that won all the battles. A movie of eternal values made by Dean DeBlois, the creator of Lilo & Stitch, for everyone, kids or adults, it is impossible to feel indifferent. Isn’t surprising to see that achieves a solid score of 7.8 in IMDB and a wonderful 90% of the reviews in Rotten Tomatoes. A worth watching entertaining movie. The soundtrack is a pleasant harmony that establishes a smooth connection with the scenes, never overlapping them. Indeed, only disputes for the viewers in the final fight. The superb image quality presented in this film should be highlighted, with a phenomenal work done by the technical team, as we can see by the detail of the sand in the scene where Toothless tries to impress the beloved with a dance ritual.